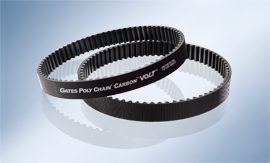 PolyChain® timing belts are the efficient solution for areas where otherwise chains can only be used. The special polyurethane mixture and the tooth shape, which has been optimised for capacity, make the PolyChain® drive belt one of the belts on the market with the best transfer properties. 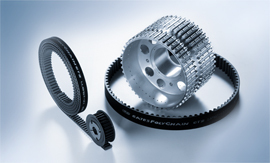 Walther Flender can supply the PolyChain® drive belts in various designs - such as electrically conductive of for very high ambient temperatures - and with the appropriate timing belt pulleys (including special variants) - and they will always be suitable for your individual application.